When I was little, and we lived on Greendale Drive in Anchorage, fall arrived with the shrews. While we went about our business - buying new winter coats and enjoying the frosty September mornings - a legion of rodents would begin their annual assault. I, in fact, never saw a live one in the house - just their little mangled corpses pinned beneath a metal bar or a thin, naked tail snaking its way out of the mouth of "Kitty," who was meaner than spit but a fine mouser. Nevertheless, I learned through this experience that home invasions should be frowned upon. This impression was further reinforced throughout the years. There are those Looney Tunes cartoons featuring a horde of termites that buzz up a wooden home, leaving only a porcelain sink, a tub, and a bewildered couple behind. Then that little baby termite would come and eat up that last toothpick in the guy's mouth. The poor Ingalls family lost their home to those vicious locusts. A cockroach on the counter means there are like twenty thousand in the walls. And now, as fall approaches, I find that my small-but-fabulous flat is being invaded by a small army of pill bugs. They're crawling under my back door. This much I know. But even these tiny creatures with their cute little exoskeletons can give me the heebie-jeebies. I blame it all on my Alaska roots - we are taught from a very young age to give moose a wide berth and to never run from a bear, but on the subject of creepy-crawlies we remain largely uneducated and inexperienced. So it is with a nervous cringe that I tweeze these hapless little critters between my thumb and index finger and fling them out into the back garden (where, I'm sure, they immediately begin the long march back to my bath mat). If they stay still, I'm usually okay. But if they move a tiny little antenna or brush me with one of their hair-like legs, I can't take it. I make a very childish noise and drop them back onto the bathroom floor, where they roll around like tiny billiard balls. And we try again. I think I'm secretly afraid they are going to run into my mouth. Do you know where this shirt came from, lady?? What is it about Paris that intimidates me? Is it the high fashion, the gourmet food, and all the people (even very small children) speaking fluent French? 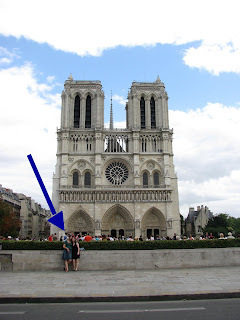 Of all the places that we visited, Paris was the stop that I was most worried about. I saw it as a city that I should know a lot about - it is famous after all - but the things that make it famous are things about which I am an idiot. High society. Romance. Just standing around looking really good. So forgive me if the thought of spending time in this city dredged up those feelings of thirteen-year-old Jessi trying to hang with the cool kids. As it turned out, Paris is wonderful. Although none of us speak a lick of French beyond the basics like bonjour, merci, and buffet, and although we didn't have Rick Steves or actually any guidance with us whatsoever (we bought a map from a vending machine at the train station), Paris wooed me like she's wooed the rest of the world. If we had known more about the city, or if we were spending more than 24 hours there, we probably could have done it up solid. But, in the spirit of making the best of it, we just gave it a go, strolling along the Seine from Notre Dame to the Eiffel Tower. Paris is just chock full of ambiance, with her tree-lined neighborhoods and street vendors. Being there made me want to study art history, to make friends with bohemians, to learn French, and to shop somewhere other than the Gap. Started at Notre Dame. I wasn't sure if you could see Sarah and me, so I drew a little arrow. Close up in one of the doorways of the church. The most legendary foosball table ever is on the bank of the Seine. I really wanted in on that action, but didn't know how to say "C'mon guys! Give me a turn!" in French. The Arc! Just a few days after the Tour de France, too. No label. You're not stupid. Laurilee and I took a Ferris wheel ride to get a different view of Paris. So, Paris was lovely. I understand now why everyone is so crazy about her. *Mel Gibson, Maverick. It's time to watch it again. Much like Michael Phelps, I have some records to break. I've had the opportunity to visit a lot of different countries in the past ten years. But never could I claim to have slept in three countries on one night. That's right. On one Thursday night/Friday morning I slumbered my way through Italy, Switzerland, and France via an international night train. I know, I know. Amazing. Nevermind. I'll be the judge. I just let the train do all the work. That's my secret. I think that it could have been built in a day. We were sad to say goodbye to Florence with all her magical vistas, beautiful statues and cheap accommodations, but the time came to catch a rail and head south to the Capital. The Termini station gave us our first impression of the city - big, hot, and crowded, with plenty of McDonald's. There are TWO in the train station! Well, one was across the street. Our place (a pension, accent on the "on") was near the station, which was always a relief for this pack mule. We found it without incident and immediately participated the grand Roman tradition of taking a long nap during the hottest part of the day. It was glorious. This started a pattern for our four days in Rome: Wake up, breakfast, see the sights, lunch, sleep, evening walk and dinner. And Rome has got some stuff to see, let me tell you! On our first evening, we found Capitol Hill and the ruins of the ancient Forum. And we visited the Pantheon for the first time - this became a nightly stop. 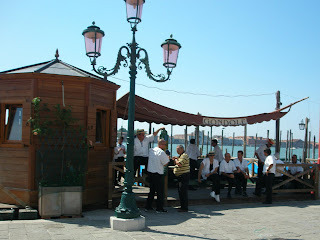 There were restaurants lining the piazza and usually a musician or two - see the guy singing opera? The next morning we sorted out the Metro (we're pretty much experts on any underground system now) and rode it to the Borghese Gallery, an amazing museum set in the middle of a park. The Gallery used to be the Borghese family's party villa on the outskirts of the city. The downstairs rooms contain mostly sculpture - each room featuring a particularly famous piece in the middle and less-famous pieces around the edge. Oil paintings covered the walls of all the upstairs rooms. Paintings by masters like Michelangelo, Rafael, and Caravaggio. Hmm. At this point I had planned to describe some of the works that I saw, but I can see that might bog things down a bit. If you're like me, and you can only recognize the names of the great Renaissance artists because of the Teenage Mutant Ninja Turtles,then we all have a ways to go before Way to Go Kevin! can focus on art appreciation. So I'll stop there for now. ...which are surprisingly fast and complicated. Yup, we were those tourists, tottering on the edge of control, taking up the sidewalk, laughing and yelling at one another to slow down. On our second full day, we demolished ancient Rome (figuratively). Palatine Hill, home of generations of Caesars and Emperors, is a mound of red-stone ruins today, but with a little imagination, you can picture the Imperial Palace. It also helps if you've seen Gladiator. After that, we went to the Colosseum. It's a wreck! The floor is all torn up. The walls are falling down. I mean, sure, it's nearly 2,000 years old, but still. Actually, it was very cool. Not temperature-wise. Throughout it all, we consulted our good friend Rick Steves. Special thanks to Sarah, who brought him along. My nose was stuck in this book the entire time. On our last day we visited St. Peter's Basilica and the Vatican Museum. There was really only one thing at the overwhelming Vatican Museum that we wanted to see so we made a beeline for it and it still took about half an hour of steady walking to even arrive at the chapel door. We were herded like cattle the whole way. Apparently a lot of other people wanted a gander at that ceiling. But it was worth it. We couldn't take pictures. We couldn't stay long. The overall effect of the chapel was, I'm sure, marred by the hundreds of tourists packed into the room like sardines. And it was still worth it. St. Peter's Basilica and the home of the Pope were interesting, too. I've only ever seen this square when it is featured in the news because of some papal event, and then it is always smothered with worshipers. The church itself is huge! Bigger than St. Paul's in London, which is also huge. All the furnishings and statues inside are built on a large scale in order to make the overall effect of the church seems smaller. Does that makes sense? Just ask Rick Steves - he explains it better than me. Okay, almost done. We ate good food and saw more fun things like the Spanish Steps and the Trevi Fountain. We ate a LOT of gelato. Less exciting was the line we discovered when we got there. Then it was on to Paris via the night train! Florence, or Firenze for those in the know, is very photogenic and I am tempted to skip the airing of my Florentine ignorance and just post some pictures. But I’m not happy if I’m not embarrassing myself, so here goes. Ask me a month ago, and the only thing I could have told you about Florence is that Lucy wanted to go there in While You were Sleeping. And I knew it was in Italy. Renaissance art, you might say. And even today, if you can see past all the tourists and the pay toilets, the theme of the city is beauty. Beautiful buildings, music, statues. For centuries, marble figures have been standing on pedestals, posing for students and their sketchbooks. Street musicians are out every night, playing in the piazzas. Sidewalk artists recreate famous paintings with chalk and concrete day after day. It’s touristy, yes. But I almost feel like that’s fitting. The appreciation of the people around me affected my appreciation, and the impact of this city has reached far beyond her walls. This is where important things started – where men learned how to achieve perspective paintings and how to capture emotion in stone. And I think that the amount of work and effort and imagination required to try and replicate this world in oils or marble is a testament to the power and imagination of the One who created everything in the first place. 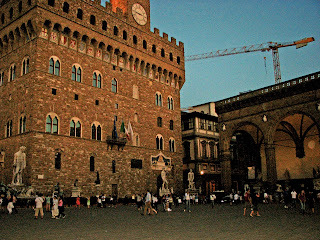 The Piazza della Signoria was my favorite place in Florence. The statues have been there for hundreds of years, turning the square into a famous open-air gallery. This is the original site of Michelangelo's David, but he was moved into a nearby gallery and replaced with a copy in the eighteen hundreds (don't quote me on that date). In the middle is Megan, a friend of a friend who graciously opened her flat up to us for three days AND showed us around town! She's great. You should be friends with her. Our sweet digs, Florence edition. Degrading famous works of art! Teaching the next generation the ropes. Very sweet scene. I took this picture to prove that I was really there, but, on reflection, it looks a little superimposed. Laurilee and I stare blankly at the woman behind the ticket counter for so long that she begins to worry that her English wasn’t correct. The woman in Marseilles was sweet and helpful, and although she couldn’t magically conjure up a non-existent night-train to Venice, she could get us as far as Nice today and then on to Venice the following afternoon. Better than nothing, we said, and started looking for accommodations in Nice. This was the most unexpected hiccup (hiccough? I never know.) during our entire trip, and as problems go, it wasn’t earth-shattering. We had to book a semi-expensive, semi-dodgy hotel near the train station in Nice and we lost half a day of Venice, but other than that it was a piece of cake. It’s all true! No roads! Just canals! I can’t remember the first time I had ever heard of the concept, but I remember as a little girl trying to imagine what it would be like to use a boat instead of a car. I loved the idea of Venice, full of water-roads and winding walkways. It was exciting to step out of the train station and be immediately greeted by a busy stretch of the Grand Canal, with tourists loading onto buses and mail-boats zipping past with bags of letters and stacks of parcels. Venice has some really wonderful sights, including the Guggenheim Museum, Saint Mark’s Basilica and the Accademia art gallery. But we didn’t go to any of them during our shortened stay. But that was fine. I was mostly just there for the canals. Some gondoliers. Too rich for our blood! The place we stayed brought breakfast to our room. They're sweet. Although we had to walk up three flights of stairs and share the bathroom with the rest of the floor, I think that our hostel in Barcelona was my favorite. Our room was large – with a bunk bed and a double and a twin. High ceilings, tile floor. We had a small conservatory with giant windows and a table with chairs where we could sit and look into the back windows of the entire block. I wanted to purchase one of the canaries that the vendors were selling on Las Ramblas, the city’s main pedestrian drag. To my mind sprung a picture of a little yellow bird swinging in his wire cage in our conservatory. We could try and take him on the train, I reasoned, as a fragile and complicated mascot. Or we could have staged some sort of do-gooder freeing ceremony where we flung the bird into the air and watched him fly to liberty, his feathers blending with the setting sun. Here's me checking out the price of birds. But, as it turns out, the birds were 40 euros, not even counting the cage, so it was not to be. All for the best, I suppose. Our freeing ceremony, although good intentioned, would probably have left the bird unable to fend for himself after years of captivity, fighting pigeons five times his size for crumbs of paella and trash. Eventually, we would find him with a five o’clock shadow on his little feathered cheeks and fingerless gloves on his orange feet, whistling a tuneless song, a tiny little hat at his feet to catch contributions. I don’t want that on my conscience. So we left the birds at the pet shop and enjoyed our time in Spain anyway. We bought breakfast from the same little coffee shop (The Times) every morning, carrying it back to our hostel to enjoy in the conservatory. Our days were spent rambling on Las Ramblas, learning the Metro, visiting La Sagrada Familia Cathedral, and finding the beach. Barcelona is in the Catalonian province, and I was worried that everything would be in their own special, secret language of Catalan. But our stammered and fuddled high school Spanish was enough to get us around. Laurilee and Jannell have a conversation on Las Ramblas. Sarah and I buy some bread for dinner at the market. Paella. Probably the most accurate-looking food known to man. There's no mistaking what you're getting yourself into with a plate of paella. The interior of that eternal work-in-progress, La Sagrada Familia. On to Italy via the south of France! Note the discrepancy in backpack proportions. One of the highlights of being here in England has been the opportunity of living so close to London. I've been able to visit the "Big British Apple" many times, always with a new mix of friends and family. Although catching the 4 am bus from Bath to Victoria Station in London wasn't my most favorite scheduling in the world, I was able to meet up with my three traveling compadres just a few minutes after they arrived in the city, for our first stop in our four-country tour. 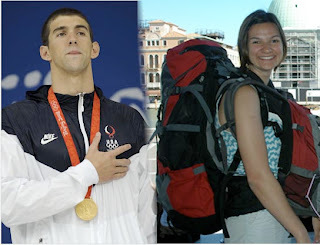 All I could think on the five-hour drive was "please let their backpacks be as big as mine!" When my three dear friends rounded the corner, strapped into their cute little pill bug packs, I realized that maybe I should have left the tennis shoes at home. And the regular-sized shampoo. And the two sweatshirts. And the jacket. Everything that seemed so essential at two in the morning (just a few short hours ago) was now slung over my shoulders. Ah well. Seeing my Alaska friends at the Victoria Station threw me into a world-colliding-disorientation that is becoming more and more familiar. Laurilee, Sarah, and Jannell, after all, round out my total American visitor list to an even 10. London can be a pricey place to sleep, but thanks to Hotwire we were able to find some very reasonable accomodations in the beautiful London haunt, the Holiday Inn Express. We were happy to camp out there for a few days, see some sights, and get adjusted to time zones and group dynamics. Sound of Music! Maria was a little over the top (your place in my heart is safe, Julie Andrews) but the music was, as always, fabulous. Those Von Trapp kiddos have some pipes! Hunted and discovered a good old, dark paneled, English pub. After a few days in London, we braved the Gatwick Airport and entered the orange-hued world of EasyJet to fly to Spain. Wait Jess, you may ask. Haven't you already been to Spain? Well, yes. I did just go last month. But this is different Spain. This is Barcelona! Home of all the Barcelonians! Beginning on July 17th and ending on August 2nd, Jessi and her three intrepid friends, Laurilee, Sarah and Jannell, set off to see the world. Well, part of the world. Armed only with enormous backpacks, pre-moistened face wipes, and doggedly cheery dispositions we chugged through Western Europe in a flurry of camera flashes and mispronunciation. Now my tiny flat is littered with ticket stubs and loose change and sleeping pallets and the empty shells of backpacks. I don't want to say much more until we get through some of the pictures. Maybe a country per day? That sound like a healthy pace?